Google has just launched “Indian Language Internet Alliance” with an aim to target 500 million+ Internet users from India by 2017. Under this alliance, Google will partner with regional languages content providers, and showcase their content under one single window. As per Google research, there are around 200 million Internet users in India, and about 190 million English speaking people. Their research states that almost 100% of them are online right now, and the growth has reached a saturation point. The next wave of growth has to be from the other 90% which doesn’t speak English but their regional languages. Aiming for this market, Google has collaborated with hundreds of regional content providers, and showcasing their content via “Indian Language Internet Alliance”. To start the process, they have launched HindiWeb.com, a site where curated content from the partners of this alliance will be showcased. As of now, this alliance consists of some well known publishers such as Times Internet, C-Dac, Reverie Language Technologies, LinguaNext Technologies, DB Digital, and Amar Ujala Publications. Considering that it’s a Google project, more regional content providers are expected to join this alliance shortly. Besides showcasing their content under one common platform, Google will also assist them with technology and monetization methods, the details of which are still unclear. Along with this launch, Google also announced that Voice search would now be available in Hindi, along with search results from Knowledge Graph. 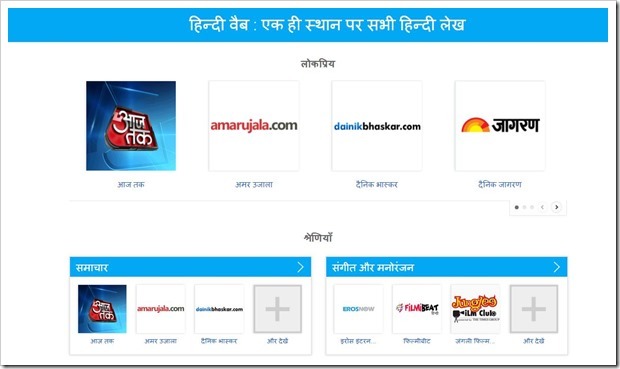 Multiple Hindi fonts can also be used from their fonts database. Interestingly, Government of India has recently launched eBhasha platform for localizing digital content. Will Regional Publishers Suffer ? However, some skeptics have denounced this initiative, stating that this move will kill local newspapers. As per them, local newspapers and regional publishers are thriving because their content is not available anywhere besides their own websites or newspapers. Once they join this alliance, then their content will be ‘hijacked’ by Google, and they will monetize it without providing due credit or share to the ignorant regional publisher. Additionally, once the content is cached and indexed by Google, they can even translate it into several languages, thereby diluting the ‘exclusiveness’ of the whole purpose. Backers of this theory are stating that it’s a trap by Google to capitalize on the regional content without creating it, and then exploiting it for their own benefits. Proper framework should be created to safeguard the interests of the small regional publishers, against multi-billion dollar Google before adding more members and displaying their content. We do understand that it is necessary to introduce non-English speakers into the amazing world of Internet, but at the same time, it is also necessary to protect regional publications and stop their exploitation. "Google Launches Indian Language Internet Alliance To Reach 500M Non-English Readers", 5 out of 5 based on 1 ratings. Burger King Offers Whoppers, Goodies On Ebay Before Delhi Store Launch. Why Did They Do It?